Since 2012, building on its experience with Shaanxi Normal University (see History), WoLearn, as a CETIS spin-off, has been developing a model of collaboration between Chinese and UK academics based on open online courses. The idea for this came out of the developing MOOC movement, where academics and Universities started investing time and money in developing freely available online courses. 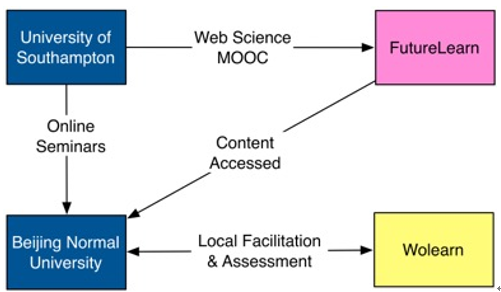 At WoLearn, as believers in open online learning, we sought to enhance and develop a use for this work as a contribution to finding a pathway to sustainability of the open learning movement.